My son, my wife and I have been messing around with model rockets. They seem to be a big thing in the USA, but are a lot less common here in the UK. They are a lot of fun. The total cost was £30. Making the rocket involved a bit of glueing and assembly, but was fairly straightforward. Then we inserted some wadding (to protect the internals from the hot gas of the rocket motor), the recovery parachute and the nose cone with rotors. When it was finished we took it to a big open space, inserted a rocket motor and igniter, put it on the launch pad and used the 9v battery operated remote control to launch it. We had a few non-launches because the crocodile clips (connecting the launch control to the igniter) touched, causing a short-circuit, or fell off. Not a great design. Once we had sorted that out we successfully launched and the rocket went well over 100 metres in the air. Cool! In theory the motor should burn for a couple of seconds and then a little explosive charge fires to separate the nose cone from the main body. The main body then floats down on the parachute while the nose cone deploys spring-loaded rotors and auto-rotates down. In theory. However, in our inexperience, we put in too much wadding and packed it too tightly. Consequently the rocket blew itself apart in mid-air and the parachute and rotors didn’t deploy. We managed to recover all the bits. The parachute was ok, but the rotor blades were too damaged to use again. So we cut off the damaged section and added the nose cone back on to make a new, shorter rocket and did 2 more launches. Being lighter with the same motor it went a lot higher. Possibly over 200 metres! We made a new rocket from the nose cone and tail of the kit, plus a long cardboard tube and lots of duct tape. We did another 3 launches using C class rocket motors. Even managing to get one successful parachute deployment. However as the new rocket was heavier it got noticeablely less height, probably less than 100 metres. Don’t force the parachute and nose cone in too hard or use too much wadding. If the parachute doesn’t deploy the rocket can survive hitting the ground at speed surprisingly well. But they make quite a hole in the ground, so you REALLY don’t want to get in the way. Even in light wind the rockets can land a fair distance away. Especially if the parachute deploys successfully. So pick a still day for the launch. You can also cut some extra vents in the parachute to make it fall faster. You need a BIG open space, free from other people, animals and trees. Preferably at least 200 metres across, if you want to stand a good chance of recovering your rocket for another launch. The maximum height of your rocket depends critically on the thrust to weight ratio. Hopefully it goes without saying that pyrotechnics and objects travelling at high speed are potentially dangerous and require common sense and adult supervision. Being a software geek with a physics background I couldn’t resist doing a few calculations. 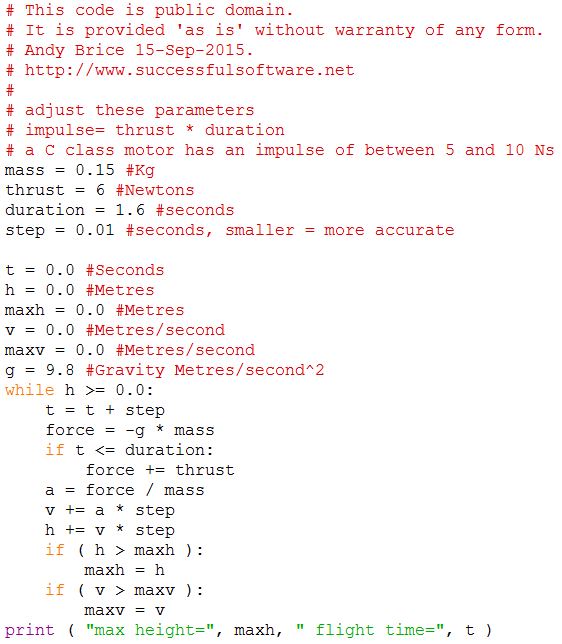 Here is a little Python script I wrote to calculate the maximum height and flight time based on the mass of the rocket and the thrust and duration of the motor. It applies a simple time-step approach to F=ma. Just modify the mass, thrust and duration variables. So you can see how critically important thrust to weight ratio is to maximum height. I think we will try a D-class motor next time (each step up the alphabet doubles the impulse). This seems to be the biggest that you can get hold of in the UK without a license. Watch out passing aircraft. This entry was posted in article, miscellaneous, software and tagged calculation, estes, kit, launch, model, python, rocket, rocketry on 15 September 2015 by Andy Brice. Indeed, model rockets are not a big deal outside the USA… except maybe in Thailand ! Look for the Rocket Festival in Thailand (on Youtube for Ex. ), these guys are crazy (frequent accidents BTW). Have you tried making a bow and arrows? It’s not less fun and if you shoot it straight up in the air, you won’t even be able to see the arrow! We have done some archery. But I think firing an arrow straight up is a seriously bad idea!